It was sitting there for what seemed like three years. Cold and alone in the leftmost compartment at the very bottom of the cold storage unit. Still wearing its shiny silver coat and encased by its Kevlar-like yellow survival chamber. Like a Kubrick astronaut in deep space suspended animation, it had to be awakened from its support system and brought back to full life. Thus began the journey that follows. Once revived, what would it look like after all this time? It had been sitting in the refrigerator crisper forever. The first thing checked was any identifiable date. There was “no born” on date, but there was a “best used by” date. The best used date read, “20May2010 C78 18:28”. Since that was less than 6 months ago, if it wasn’t at its best, it must be at least within its second best? 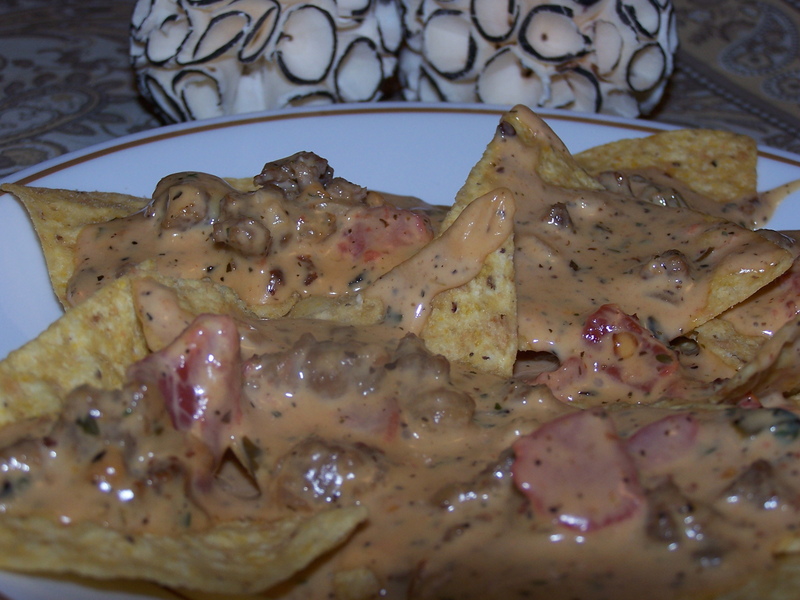 So here it is, one of the best party dips for the upcoming holiday season, the traditional RoTel and seemingly ageless Velveeta cheese dip – kicked up more than a notch. One thing not done often here is follow recipe directions closely. That’s partly because many of these recipes never actually get written down while in progress. But as the dead sea scroll picture below proves, somewhere in the distant past this one made it to paper. 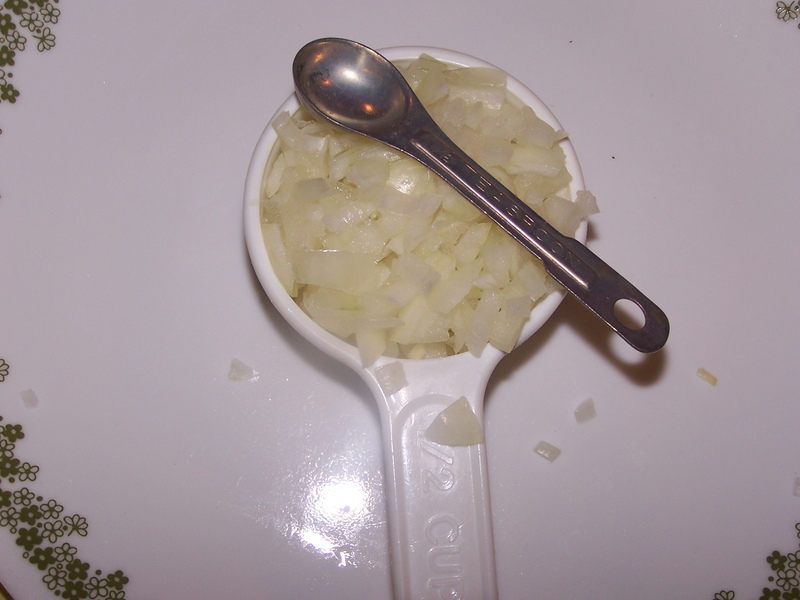 And for this one time, the recipe was followed (more or less – so don’t look too closely at the picture), including the use of measuring devices. There’s a picture of those devices also, just to prove they were actually used – or at least present. It was somewhat surprising to see the end result actually worked out really well, even without the usual cooking with abandon style. There’s also a vegetarian option included. That will keep some people reading. Brown the sausage in a frying pan. Break up sausage into the smallest pieces you have patience for. When the sausage is about 3/4 done add the; onion, black pepper, oregano, parsley and basil to the sausage. Stir all together and finish cooking the sausage. When the sausage is cooked, mix in the cumin and cook for about another minute or two. Add the sausage to the melted cheese mixture in the next paragraph. Don’t clean the pan, we’re not finished with it yet. 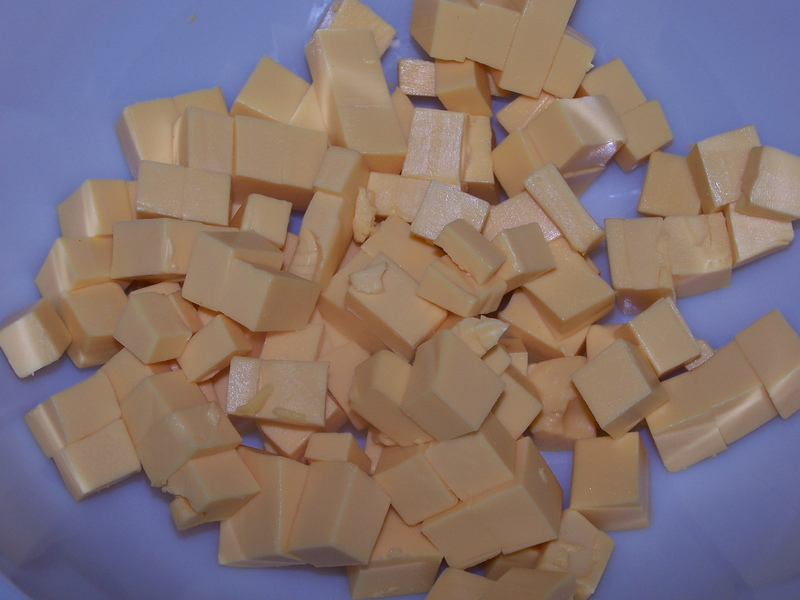 Cut the Velveeta into 1 inch cubes while the sausage is cooking. Add the cubes to a large microwave safe bowl. Melt the Velveeta in the microwave for about 2 minutes. Remove and stir. Return to the microwave and reheat and stir as needed until the cheese is pretty much melted and fluid. It doesn’t have to be hot or bubbling. It just needs to be mixable at this point. 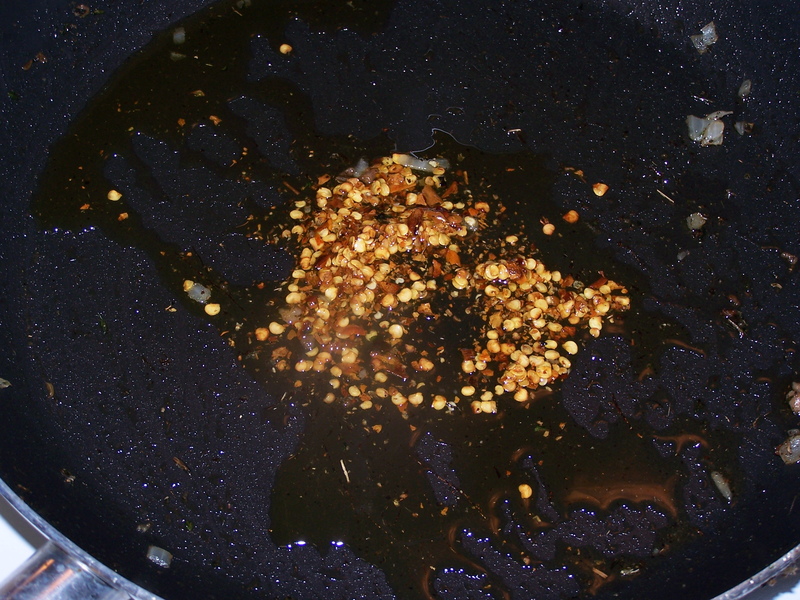 Add the olive oil to your now empty frying pan. Add the crushed red peppers. Heat the red peppers in the olive oil for about a minute or two so the oil gets a little bubbly and the red peppers jump a little. Don’t brown or burn the red peppers. 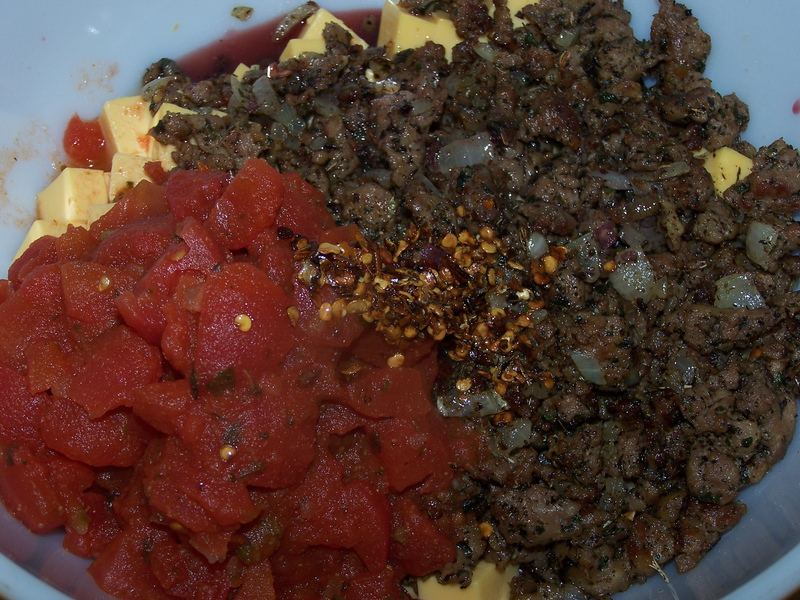 Pour and scrap the oil and red peppers into the cheese/sausage mix. Deglaze the frying pan with a little wine or water (see the link “deglaze“, if you don’t know how). Pour and scrap the deglaze mixture into the cheese/sausage mix. In truth you probably don’t need to deglaze, especially if you’re using a nonstick frying pan. But it looks so cool and impressive to anyone watching. And, deglazing is a fine excuse for opening a bottle of wine. 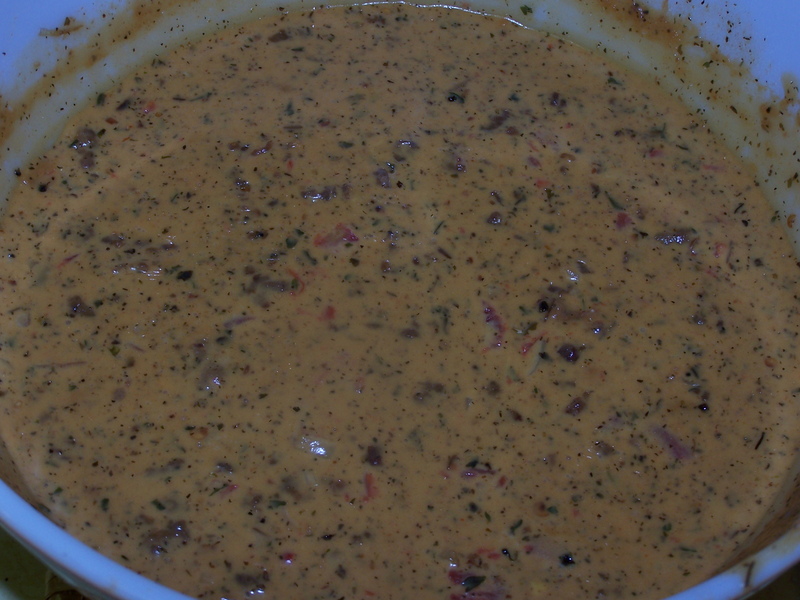 Add the can of RoTel tomatoes and chilies to the cheese/sausage mix. Stir. Heat in microwave for 2 minutes. Remove and stir again. Repeat until everything is blended, fluid and warm. That’s it. The final product tends to be a little too thick for easy dipping. Spoon over tortilla chips and go at it slowly at first. Your mouth will be hit with a progression of different flavors ending with the heat. As promised, here’s the vegetarian option. Don’t use the sausage. A meat substitute might work, but for now just add the spices directly to the cheese mixture. You might also try using a little more olive oil when you “cook” the red peppers and add the oregano and basil to the oil along with the red peppers. The unproven idea is, we’re trying to flavor the oil which is going to mix better with the cheese. The cumin and parsley can go directly in the cheese mix. There are any number of diced tomato and chilies products available that can save you a few cents. However, it appears, RoTel invented, or at least coined the basic recipe first,so they get the nod here. The basic recipe is just the melted cheese and a can of RoTel. Also, the 10 oz can of RoTel seems to be the correct proportion for 1 pound of Velveeta. As noted above, if you don’t find bulk Italian sausage in the supermarket meat department, buy some Italian sausage links. Cut the link casing open and squeeze the sausage out of the casing. Discard the casing. The feeling of all the pork fat on your fingers is indescribable. You’ll need to wash your hands at least twice to get the fat off. You may need a visit or two to a therapist to remove the feeling of pork fat from your dreams. You can also usually find bulk Italian sausage prepackaged in the “breakfast” sausage section of the supermarket. It comes in those Nerf football-like plastic packages. If you can’t find 3/4 of a pound, just nibble away on the cooked sausage until it looks like it should be what’s left from 3/4 pound. The sausage with the extra spices is pretty darn good alone. If you want more or less heat, vary the amount of crushed red peppers used. You may vary from zero crushed red peppers all the way up to being unable to sit the next day. Naturally you may also substitute your favorite source of heat for the red peppers. In general, crushed red peppers are a handy and inexpensive way to add heat to any dish. 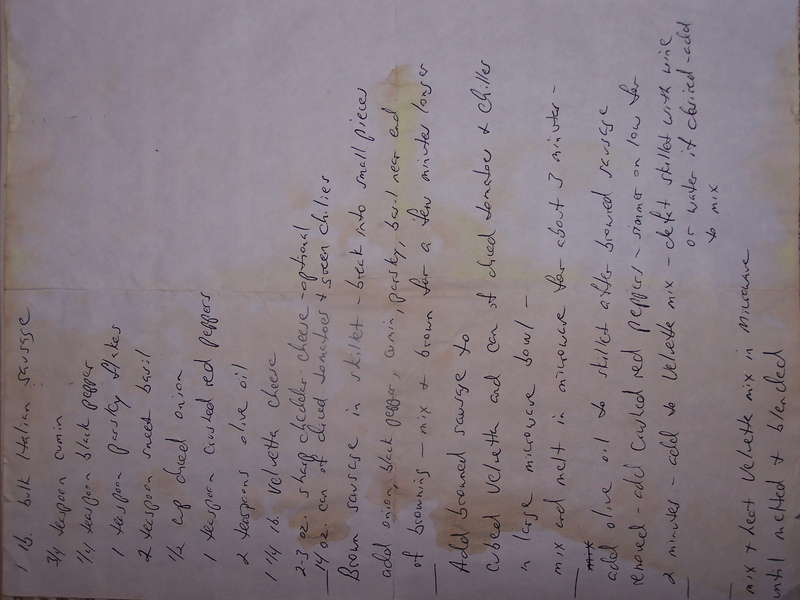 This entry was posted on 11/20/2010 at 12:29 and is filed under Recipes, Recipes, food, cooking and related items. You can follow any responses to this entry through the RSS 2.0 feed. You can leave a response, or trackback from your own site.